STRAIT TALK 20 - #348 - On Sale! SUNSPOT 29 - #112 - On Sale! RIVER PRINCESS 30 - #320 - On Sale! DAYBEL 35 - #363 - On Sale! RIVERMAID 37 - #317 - On Sale! CONSTELLATION 50 - #890 - On Sale! CONSTELLATION 55 - #891 - On Sale! Build in PLYWOOD, STEEL, or ALUMINUM. The pontoon houseboat "Rivermaid" can be built in any length from 30 to 40 ft. with choice of materials including plywood, aluminum or steel. It takes relatively little power to move "Rivermaid" owing to the narrow, yet buoyant pontoons of her tunnel hull design. A 75 horsepower outboard should give an estimated 9 knots and twin 55's or 60's approx. 13 to 14 knots. Hulls are connected with a steel framed structure in both plywood and steel versions. There is permanent sleeping accommodations for 4 in the two roomy cabins with shakedowns for 2 on the dinette convertible and one on the settee forward. The foredeck might sleep another 4 or 5 on stretchers under the awning. There is a maximum headroom throughout of 6'6". The drawings are meticulously detailed and comprehensively set out for amateurs. 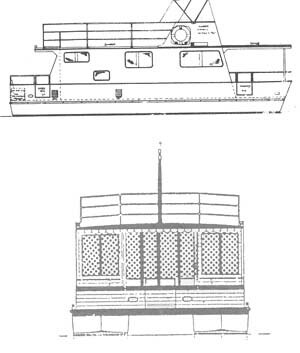 The plans comprise: accommodation arrangement, deck plan, hull and superstructure construction details, full size patterns of frames and stem, materials list and step by step procedure. Plans & Patterns Only $99, Was $225 r.